Corona Cigar Company Blog: Corona Cigar Co. has won the 2017 Trip Advisor Certificate of Excellence! Corona Cigar Co. has won the 2017 Trip Advisor Certificate of Excellence! Corona Cigar Company has won the 2017 Trip Advisor Certificate of Excellence! We are very excited and honored to receive this certificate. 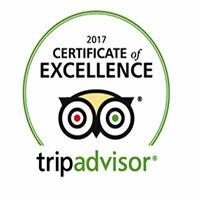 The Certificate of Excellence was founded in 2010 and accounts for the quality, quantity and recency of reviews submitted by travelers on TripAdvisor over a 12-month period. To qualify, a business must maintain an overall TripAdvisor bubble rating of at least four out of five, have a minimum number of reviews and must have been listed on TripAdvisor for at least 12 months. Establishments earning the Certificate of Excellence are located all over the world and we’re very proud to be one of them!